Illinois PTA will be advocating on these and other issues as the legislative session wraps up. We will be filing witness slips on various bills, testifying before committees, and contacting legislators and the governor. But the true power of PTA comes through when our PTA members join us in speaking up for all the children of Illinois. If you’ve spoken to your child’s teacher about an issue in the classroom or with your child’s learning, you are already an advocate. If you have raised a question at a PTA meeting about why your child’s school has a certain policy, you are already an advocate. If you have every spoken at a school board meeting or placed a school referendum sign in your front yard, you are already an advocate. Advocacy is simply speaking up for another, and PTA advocacy focuses on those who have little to no voice in the halls of power—our children. Many school boards and many legislators have few, if any, individuals speaking up on a particular issue. When you can share your viewpoint and tell how a policy or a bill will have a specific effect on your child, your family, or your community, you have tremendous influence on those who make the policies or pass the bills. Don’t take our word for it, look at what PTA advocates did to get drinking water in elementary schools tested for lead. 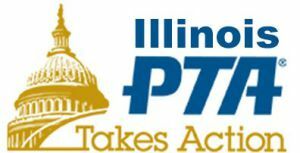 Illinois PTA makes it easy to advocate with legislators. Join the Illinois PTA Takes Action Network by going to the Illinois PTA Advocacy page and entering your e-mail and ZIP code in the Quick Sign Up box on the right. As a member of the Illinois PTA Takes Action Network, you will get occasional calls to action in your inbox. Simply click on the button in the e-mail, which will take you to a prewritten letter to your legislators. Take a moment to add any personal information, including how the bill will affect your child or school, up at the top of the letter, include your contact information, and hit send. That’s all there is to it. We know that these e-mails do make a difference. Legislators also take notice when Illinois PTA leaders start their testimony on a bill with, “On behalf of the 80,000 members of the Illinois PTA…” Your advocacy, and your PTA membership, makes a difference for your child and for every child in Illinois. Previous post: Congratulations to our District 15 IL PTA 2018 Award Winners!